Hey everyone. A few weeks ago I did a video about changing your own oil. The response has been huge. Because of the response, I thought I would follow up that video and write a little more information about changing your own oil. Changing your cars oil is one of the easiest things to do yourself. That being said, a mistake here can be very costly. An oil change is one of the most important things you can do to keep your car’s engine happy. Be sure to follow the manufacturers recommended service interval. So before you dive into changing your own oil, let’s talk about some do’s and don’ts. Be sure to have something to store the old oil. Properly dispose of the oil, oil and filter. Put engine oil in the trash. As you can see, there are plenty of things to keep in mind when doing your own oil change. Before we get into the steps to change your oil, let’s make sure we have all the right stuff. It should come as no surprise, having the right oil, filter and washer is VITAL! You do not want to be the person that has to duct tape their oil filter back on. Yes, I have seen that happen. 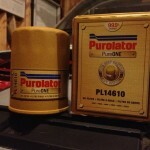 I talked a little about the differences in oil filters in the Purolator Review Post. Check that out for some filter features to consider. When it comes to oil, follow the manufacturer spec to the letter. If you are not 100% sure about the oil you need, call your dealership’s parts department. They can tell you exactly what you need, and how much oil your car requires. Tools to remove the washer on the drain plug. Be sure you have ALL the parts to do the service. We don’t want to have to run out to the store during the service. Check the engine oil on level ground before you start. Raise the front of the car up. If you are using a floor jack, be sure to safely secure the car with jack stands. At home, I prefer the drive-on style ramps. Allow the engine oil to drain for about 10 minutes. This will get most of the engine oil out. Remember, we are not in a hurry. Replace the washer on the drain plug, and properly tighten the drain plug. Remove the engine oil filter. Allow the oil to drain out of the filter. Before replacing the filter, put a thin film of oil on the filter. Replace any cover that you may had to remove. Lower your car on to level ground. Fill the engine with the recommended amount of engine oil. Double check the engine oil on the dipstick. Start your car and let it run for about a minute. Shut the car off, and let it rest for 2-3 minutes. Recheck the engine oil level, and adjust as needed. Double check your work. Make sure there are no oil leaks! Be sure to properly dispose of the engine oil. Well, congratulations, you have just crushed your own oil change. You might be thinking that 21 steps is a lot of work. But with the right tools, the right parts, and a little know how, you can to it. I really do want to stress buying top quality parts. If you have any question about changing your oil, please post it up in the comments. You can also learn more about the history of the engine oil filter here. I was paid by Purolator to review for this post with Burst Media, all thoughts and opinions are my own. All products were provided by Purolator; however are items I genuinely enjoy and feel are appropriate for my site. Nice write up. I would add, if you haven’t used ramps before, make sure you have someone that can help watch the vehicle when you drive up on them so you don’t go too far and drive off the front of them. Also, watch out for the cheap metal ramps. They hold the front up fine, but the ones I have used have a tendency to slide out from under the wheels when you are trying to get up them. I have a set of plastic ones now that have a rubber piece that sticks out that the wheels hit first and they have never tried to skid out on me. That is 2 REALLY awesome points on the ram safety Pat! I have the plastic one too. I totally forgot about those old metal ones LOL! Maybe we(as in you and I) should do a post about garage safety! I’ve always been told to fill the new oil filter about 3/4 of the way up with new oil before screwing it back on. Do you recommend this or is it not necessary? That is a really great question. The answer is, “it depends”. I don’t generally do it on VWs. I only do that when the filter is vertical. That is more likely to starve for oil, for a longer period of time. I think this is a big deal on bigger engines, like trucks. Our parts delivery truck has a filter that holds over a quart of oil, AND it’s vertical. If I change the oil on that, I pre-fill it. It is not a bad habit at all. You know, I really agree with your post. My bad when oil change is that I usually in a hurry which is supposed to be very wrong and I know that. I think the reason why I am like that is I know exactly how to do it that is why I always make it fast. Again, that is wrong and will take of note that. Great advice here. Looking forward to putting it into practice. 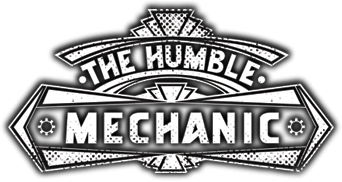 …Now just don’t write something on DIY smog checks, ’cause then I’d be out of a job! This is a great walk through. 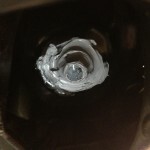 As an added note, you should wipe any metal shavings and other gunk off the oil pan drain plug before reinstalling it. Thanks for sharing your oil changing tips and process. For own oil changing process, this is a perfect guide.